Another year, another fun and successful WWETT Show. On Saturday Hydra-Tech wrapped up another great WWETT Show before packing up and returning home on Sunday – thanks to all of our customer and friends who made it to the show and stopped by to visit! If you still don’t know what this show is all about, WWETT stands for Water & Wastewater Equipment, Treatment & Transport. You can learn more about it at www.wwettshow.com. We always enjoy meeting with existing customers as well as prospects and competitors and suppliers who attend the show. We saw visitors from all over the world including India, Columbia, Guam, China, Bermuda, Dominican Republic, and of course Canada and Mexico. The 50 states were well represented too. Hydra-Tech Pumps was one of 550 exhibitors and there were more than 13,000 attendees at this year’s show. The Hydra-Tech Team helped some visitors decide if our pumps would benefit them, and if so, how best to power them and maximize the benefit of hydraulic submersible dewatering pumps. In all of our years of participating in trade shows, WWETT is the only one where we have had the experience of actually selling product out of the booth. Typically a trade show allows you to show off new products, get feedback from customers and talk about / demonstrate your equipment for interested prospects who stop in. Customers were in a buying mood this year as we sold most of the product we brought to the show to our visitors (thanks!). 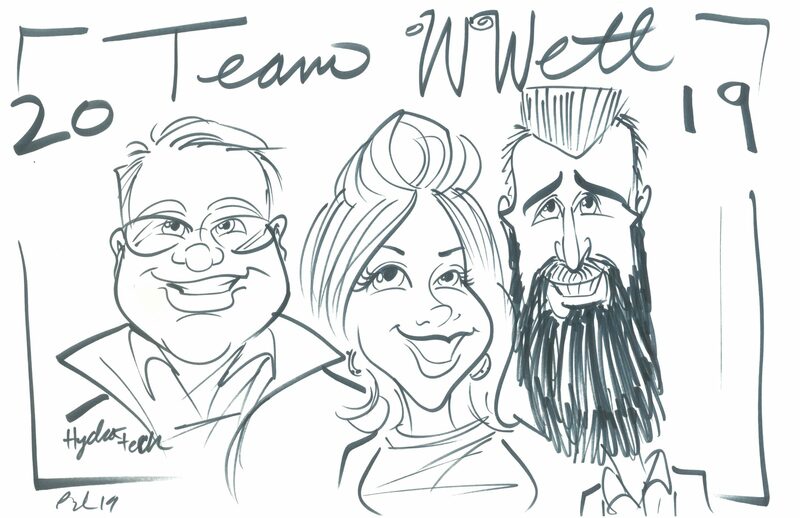 We managed to have some fun at the show at their exhibitor appreciation night. 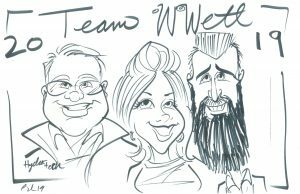 The event was Western themed, we were treated to live music, gambling with play money where your winnings earned raffle tickets for some nice prizes, caricatures, a lasso game, and a mechanical bull. We’re already looking forward to 2020. Will we see you in Indianapolis in 2020?